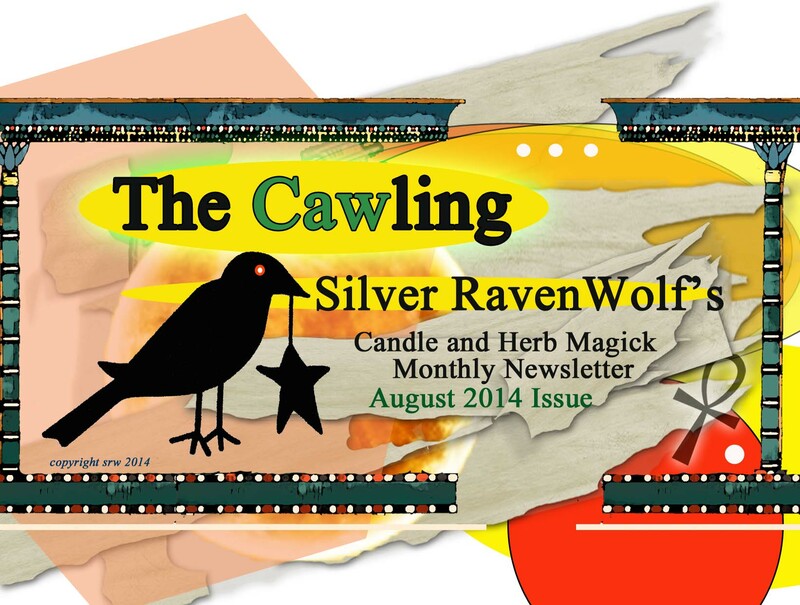 Silver’s New Monthly Newsletter — The Cawling! Magickal Tips, ideas and simple projects that you can use to make your life better! Designed for the busy spiritual person with short articles that get to the heart of the process! Whether you are looking for love, protection, healing, abundance, wisdom, finance magick or just want to take a few moments out of your busy day to connect with enchanted prose — this newsletter is for you! Living Magick Now! That’s the theme! Produced and written by noted author, Silver RavenWolf, journey into the delight of practicing your own enchantments using candles, herbs, verbal charms and more. A wonderful addition to your Book of Shadows — you won’t want to miss a single issue. This issue covers tips on Spiritual Cleansing, How to Use the Tangle Charm to draw or banish energies, Magickal Numbers in Candle Burning, How to Make Your Own Magickal Floor Wash and a short astrological section with upcoming heavenly events. There is also a 20% coupon code for purchases in her Etsy store. All the artwork and photos are Silver’s. All the writing is straight from the heart, digging into her twenty-five years of magickal expertise to share the techniques she has used to make her life and the lives of her family and friends better. Come join Silver! Welcome to the world of The Cawling! A place of simple, natural magicks! All rights reserved. No part of this offering may be used or reproduced in any manner whatsoever, including Internet usage, without written permission from the Author. Novelty item — the real magick lies in you! The word is the magick and the magick is the word — your word!